Home Revenues What is a Credit Note? A credit note is a document sent by a seller to its buyer or, in other words, a vendor to the customer, notifying that a credit has been provided to their account against the goods returned by the buyer. It reduces the amount due to be paid by the customer, (if the amount due is Nil) then it allows further purchases in lieu of the credit note itself. 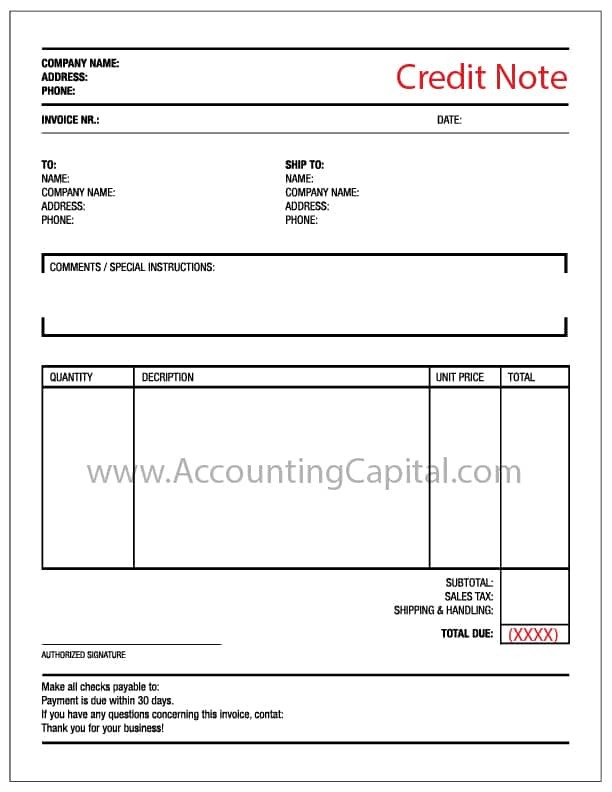 A credit note is issued for the value of goods returned by the customer, it may be less than or equal to total amount of the order. Example – Company-B sells goods worth 1,00,000 to Company-A, however, 10,000 worth of goods were found damaged due to some reason & this is notified to Company-B at the time of actual delivery. Company-B (seller) issues a credit note for 10,000 in the name of Company-A (buyer). This reduces the receivables of the seller by 10,000 and the buyer is only required to pay 90,000. 1. It is sent to inform about the credit made in the account of the buyer along with the reasons. 3. It is usually sent by the seller if the goods are found incomplete, damaged or incorrect at buyer’s end. 4. It shows a negative amount. Related Topic – What is the difference between credit and debit note? A decrease in liability to pay the respective creditor. A decrease in expense previously incurred to purchase those goods. A decrease in revenue previously booked as sales. A decrease in assets as the payment will not be made by the debtor anymore.